At last - a weight control solution that doesn't involve dieting! Are you sick of fad diets? Have you made yourself miserable by depriving your body of food, only for the weight to pile back on? Are there 'thin' clothes in your wardrobe you wish you could wear if only that extra weight would shift? If so, Ursula James, the UK's premier hypnotherapy practitioner, has the answer for you! Ursula has developed a fantastic programme for weight loss which shuns the usual restrictions imposed on dieters. This approach is designed for people like you who have tried the gruelling exercise routines and the endless calorie counting to no avail. With the aid of this book and the accompanying self-hypnosis CD, Ursula promises that not only will you become the real, confident you, you'll also understand the reasons behind your weight gain. "I cannot praise this book enough"
"...excellent book and even better CD..."
Make a charitable donation and you can get your book signed by the author. See here for further details. 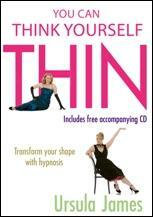 “I have just completed the three week session on the cd that comes with You Can Think Yourself Thin. I must say that the results are staggering, I have struggled with alcohol, smoking, and other so-called recreation drugs, kicking the lot with help from Alan Carr(not the comedian) and Chris Prentiss. I thought my issues were over, then my eating habits really stood out. I tried Paul McKenna but still there was a missing link, till I was lucky enough to find your book. “I have found the book to be so beneficial to me in so many ways. My eating habits have changed considerably and I have a new lease of life. I have sorted more things out in my home in the last two weeks than I have in the last two years. I feel energised, motivated and so much more confident than I have in a long time. I have three children of 8, 5 and 3 and over the years have formed unhealthy eating habits connected to my emotions with the stresses and strains of bringing up young children and leaving a successful career behind me. “Dear Ms James, I have just finished your EXCELLENT BOOK AND EVEN BETTER CD. I feel your work changing me already. May I say the hypnotherapy put me right "under" and I am thrilled to have come across your work. Thank you and I wish you so much success in your life. I also watched you on Youtube and have reccommended your book extravegantly to my friends. NOTE: This testimonial is so warm that it may appear to have been fabricated. It is not. It was received by email to Ursula James in July 2010. I stumbled upon your book recently at a local bookstore and let me tell you in all honesty, purchasing "You Can Think Yourself Thin" is the best decision I have made thus far in my entire adult life. You see, I have been a bulimic/yo-yo dieter since the tender age of 10 years old. I have struggled with horribly negative body image & a weight problem my entire life. To be quite honest, my weight and appearance are what consume at least 3/4 of my thoughts-- until I read your book. Upon completing the first two tracks of your program my brain has completely changed. I have not experienced even the slightest trigger (even stronger than the norm with Bulimia), have immensely less negative thoughts and feelings, feel so much more lighthearted/carefree-- the list goes on. I cannot even imagine how amazing I will feel after the 3 weeks of track 3. I am on a high unlike any other. Thank you for helping me reclaim my life-- for SAVING my life! What you have done is revolutionary and will (and has) dramatically change the lives of women.